I was provided with products in exchange for my honest opinions. Your views may differ to mine! Thank you! Everyone get out to the store RIGHT NOW and pick up GUITAR HERO: LIVE! It is honestly one of the most fun games that I have had the pleasure to play, this year and it even comes with a newly designed guitar, new playable songs and a rush of fun that is as good now as it ever was with the original Guitar Hero game way back in the day on its first release and first system! I have Guitar Hero: Live on Xbox 360 and I am so enamoured with this game that it brings back so many great memories and moments with friends over the years that only Guitar Hero can bring that with it being playable with others online and on my own, I am now in an even bigger world of crazy with this fabulous, fun game that just doesn't get old! I can play this with my kids and they love it, too, which makes this a great family game in its own right with play-offs against one another and everyone able to try and out-do the last person and lots of booing and hissing when the other guy keeps getting it wrong! 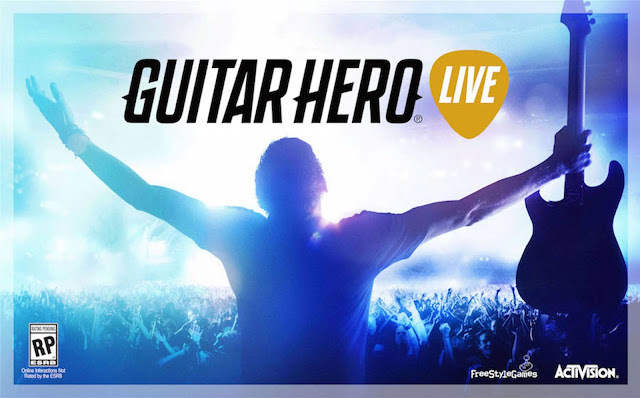 FreeStyleGames and Activision have done it, again, with this game that is truly for everyone but best for older kids who are able to grab the guitar and make it sing as they rock out to their favourite tunes and become the rock legend they always wanted to be! You can pick up Guitar Hero: Live in just about all good games stores and retailers across the country and right in time for the big day, or just after, when you've gathered all that gift money that you'd love to splurge out on something as fun as this game is, right here with so many songs at your finger-tips, you'll be going for days! For more infomation on Guitar Hero: Live, visit HERE at the official website! Come back and tell me how you feel about the game and how you're getting along playing it, this Christmas! You won't be able to put that guitar down! !